Is Confidence TXI 1100W Your Choice? Making a choice can be fiddly at times. Sometimes, you would think that you already made a choice but at the end you end up deciding otherwise. This is very real with buying Confidence TXI 1100W treadmill. At the beginning, you might think that it is not what you want. But, after learning more about it, you may realize that it is your choice. Now, is Confidence TXI 1100W really your choice? To help you become 100 percent sure, hopefully, here is my review on this product. I can tell you all about the good points about Confidence TXI 1100W to make you buy it. But, I will not do that. I am here to give you an idea about this product to maybe help you make your choice which treadmill to buy. I am not into making you purchase; I am more into assessing different kinds of treadmills to help out people like you put together a more evenhanded choice in acquiring a treadmill. Therefore, we should start with identifying what you need. If you want to exercise at the comfort of your home, then this exercise machine could be a better choice. You can choice one that will fit in your area. You may also choose one that is foldable for easy keeping and using. This model is foldable and very easy to manage. If you want to monitor how you are rating while exercising, then again this is a good choice. This model has monitors that tell your calorie burning, heart rate, speed, distance and time. If your intention is to jog on the machine, this model can afford you just that. It is very sturdy and strong. The shock absorption on this machine is superb and very reliable. With this treadmill, you may say that you are able to get your money’s worth. Personally, after going through the advantages I can obtain from this treadmill; I can state that it is a fine choice. Confidence TXI 1100W is one of the top models of Confidence Fitness. It offers unparalleled features such as an automated incline of up to 12%. It also has built in speakers to provide you a unique experience while exercising on your treadmill. The hydraulic folding system of this model may provide you the comfort and ease of storing and making ready your exercising machine. If you have limited space, this machine will not be a bother at all. Speed buttons are provided wherein you can start your fitness program by merely walking on it. Then, you may progress to brisk walking and eventually run. For a more strenuous exercise, you may increase your pace for running. 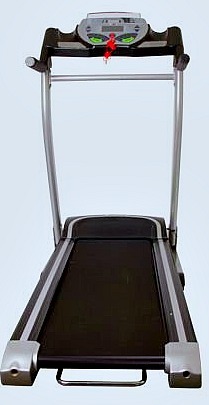 You may also use the electronic incline adjustments to make your exercise more exigent. If you want to adjust your speed, you may do so with the adjustment buttons at the side arms of the machine. And if ever you accidentally fall while exercising, the emergency stop clip attached to your clothing will automatically stop the machine. This treadmill can only take up to 308 pounds, so if you weigh more than that; it could be a problem. It is quite pricey than other models. At $562.65, but with free delivery, you might reflect many times prior to making the ultimate go for it. Confidence TXI 1100W almost have all the features and specification that you may desire. Its console is well-built and very functional. The shock absorption is very useful and effective. There is more extent for running and walking offered by the running surface’s dimension. It has adequate motor which can support your utilization and program. At least, you will not be irritated with its sound as it is quieter than most models you encounter. The monitoring system is likewise very efficient. You may get the actual rating of your performance. As a fitness enthusiast myself, I recommend that you consider using a treadmill for your home exercise. It is not often that you may have the time and the energy to go out and jog or run. But, if you have an exercise machine such as a treadmill at home, you may do your walk or run anytime you are able. Confidence TXI 1100W is one treadmill that I may recommend for you to consider. After reading my evaluation, you may establish that this model is satisfactory for your exercise requirements at whatever intensity you are in. However, if you think that you would rather have another choice; you may look at my other reviews on other treadmills of almost similar features and specifications. Confidence TXI 1100W is a heavy duty motorized electric folding treadmill which is good as a running machine. The motor of this exercise machine is 1.5 HP with 1100 watts. The runway size is 74.2 inches by 15.7 inches. The full product size is 65 inches by 27.6 inches by 53.1 inches and weighs 123 pounds. When the machine is delivered to you, the package size would be 66.18 inches by 29.9 inches by 12.6 inches with a weight of 138 pounds. The price at Amazon.com for this brand/model is $562.65 with free deliver within the United States. Shipping period is usually within one to two months. Commonly, you may purchase from the manufacturer. But, dealers and distributors such as Amazon and eBay are also good places for buying treadmills.